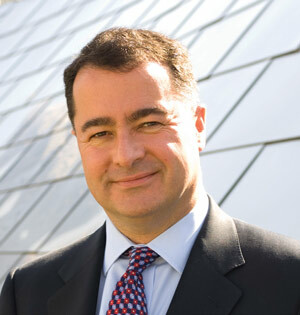 Steve McGill is group president of Aon plc and chairman and chief executive officer of Aon Risk Solutions. He oversees the development of Aon's overall growth strategy and opportunity planning. Global Finance: What events over the past 25 years have shaped the current global economy? Steve McGill: The fall of the Berlin Wall in 1989 and subsequent collapse of the Soviet Union changed the world dramatically as communism gave way to capitalism and democracy (to varying degrees) in most countries. The Arab Spring of the last two years may in time turn out to be similarly important. The emergence of China, India and Brazil as major global manufacturing and trading partners has reshaped the global economy. The rise of the eurozone seemed to herald the emergence of a new unified economic power, though current challenges may be calling that into question. In the financial world, it has been 25 years since the stock market crash of Black Monday in October 1987. Since then we've also had the Enron collapse leading to a new era of corporate governance, and the subprime mortgage crisis that threatened and ultimately reshaped banking systems around the world. Each of those events caused financial turmoil, but after each the global economy has recovered and gained new strength. Technology and, in particular, the Internet have also had a profound impact, revolutionizing business but most importantly connecting people around the globe. McGill: Developed markets face fundamental challenges as emerging markets provide new competition. In some cases, emerging markets will leapfrog the more established nations as they develop their physical and financial infrastructure without legacy constraints. Emerging markets face significant social and economic strains as their populations move rapidly from agricultural to industrial and service-based economies, with high associated expectations for their quality of living. Population growth will stretch the availability of resources, and environment change may disrupt not just patterns of trade, but patterns of human habitation around the world. To thrive, firms will need to work with trading partners globally, respond nimbly to market developments, and stay connected to clients worldwide. They will also need to understand both the opportunities that technology creates and the threats it may provide to established operating models. GF: How will the role of insurance evolve to cover these emerging risks? McGill : Insurance first came into being to support international trade, and it will have an even more important role to play as organizations of all sizes find themselves sourcing from suppliers and selling to markets around the world. Changes in operating models and the need to operate in web-time may lead to insurance shifting away from annual policies to a much more on-demand model. But some of the biggest changes will come around demographic change, with increasing longevity requiring novel solutions to help individuals, employers and governments deal with the effects of people living longer, working longer, and needing to fund their old age for much longer. GF: What combination of new tools and resources will insurers require to assess and manage complex emerging exposures in the years ahead? McGill: Modeling and risk management tools will continue to improve, with each event providing new data to better prepare for the future. In recent years, we have seen huge advances in the modeling of hurricane risk in the US, for example, and over the next decade we will see further advances for emerging risks [particularly catastrophic events and catastrophe risk modeling]. Technological advances such as these will assist insurers to manage their regional exposures in the years to come.